At the Firelake Arena in Shawnee, OK, Friday night promoting were DiBella Entertainment, Tony Holden Pomotions and HD Promotions on ShoBox featuring WBC Super Featherweight Silver champion Spain’s Jon “Jon Fer” Fernandez, and Carlos Ramos both managed by former world champion Sergio “Marvilla” Martinez. WBC No. 9 Super Featherweight contender Jon “Jon Fer” Fernandez, 16-1 (14), of Spain lost his WBC Silver title to O’Shaquie “Ice Water” Foster, 14-2 (? ), of Houston, TEX, over 10 rounds. In the first round Foster dances around the ring as the taller Fernandez stalks him. Foster landed a jab but was countered with a Fernandez right to the chin. Foster seemed to waste a lot of energy dancing around and doing little on offense. In the second round Fernandez landed a jab and was countered by a right to the chin by Foster. Foster continues to dance around the ring while Fernandez seemed to have problems cutting the ring off and catching him. Foster landed a counter left hook knocking the head of Fernandez back. Foster ended the round with a solid jab knocking the head of Fernandez back. In the third round Foster continues bouncing around the ring using his hand speed when Fernandez gets close to counter him. In the fourth round referee Lawrence Cole warned Foster for hitting behind the head. Foster landed a solid lead right to the chin of Fernandez knocking his head back. Fernandez continues to have a problem landing a solid punch to the “moving target” Foster is giving him. Fernandez landed a left hook to the body but got countered with a right to the chin. In the fifth round Foster landed half a dozen body shots on Fernandez. Fernandez continues to have a problem landed anything solid due to the movement of Foster. Fernandez has marks under both eyes at the end of the round. In the sixth round the same pattern of the fight continues. Just prior to the end of the round Fernandez got his best punch of the fight a short right cross rocking Foster. In the seventh round Foster landed a nice left hook to the chin of Fernandez. Both boxers exchanged left hands to the chin of one another. Fernandez had a better round. In the eighth round Foster landed a solid right to the chin of Fernandez. Fernandez landed a short chopping right but got rocked with a Foster left hook to the chin. In the ninth round Foster continues countering Fernandez while moving around the ring. In the tenth and final round referee Cole again doesn’t have the boxers touch gloves. Fernandez continues to miss most of his punches. Fernandez landed a good right cross head to the chin of Foster. Against the ropes Foster countered well against Fernandez. Scores were 98-92 by all three judges and 97-93 by this writer. 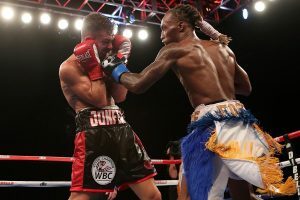 In the co-feature Super Featherweight Irvin Gonzalez, 11-0 (9), of Worcester, MASS, easily defeated Ecuador’s southpaw Carlos Ramos, 9-1 (6), of Spain made his US debut, over 8 rounds. In the first round southpaw Ramos landed several lead left hands to the chin of Gonzalez. Ramos is shorter and fights out of a crouch. Gonzalez used a good jab but got countered by a left from Ramos to the head. In the second round Gonzalez switched to southpaw landed a good combination then returned to orthodox. Moment’s later back to southpaw Gonzalez landed several good punches to the head of Ramos before returning to orthodox. Referee warned Ramos about using his head at the end of the round. In the third round Ramos landed a solid right hook to the head of Gonzalez. Ramos missed with a lead left and got countered by a chopping right to the head by Gonzalez. Again the referee warned Ramos at the end of the round for using his head. In the fourth round Gonzalez landed a double jab but got countered with a left to the chin from Ramos. Referee warned both fighters for hitting behind the head. Gonzalez landed a 3-punch combination to the head and body of Ramos. Ramos held and hit Gonzalez twice and was warned for holding and hitting. Gonzalez had a welt under his left eye at the end. In the fifth round both had a good exchange. Ramos told the referee he had vasoliene in his right eye so the referee stopped the action and allowed Ramos to go to his corner to get it whipped clean. Gonzalez warned for pushing Ramos to the canvas. Ramos landed a solid left to the head which was his best punch of the round. Gonzalez was much busier than Ramos. In the sixth round Gonzalez out worked Ramos who is only throwing one punch at a time. Ramos landed the last punch of the round a lead left to the chin of Gonzalez. In the seventh round Ramos dances while in one spot without throwing anything while Gonzalez lands a right to the chin. Gonzalez landed a combination to the chin of Ramos. In the eighth and final round Gonzalez landed a double jab ending with a right to the chin of Ramos. Gonzalez jab keeps Ramos on the defense. Ramos finally landed a combination to the chin of Gonzalez. Gonzalez landed a solid lead right to the mid-section of Ramos. Gonzalez continued out working Ramos right up to the bell. Scores were 80-72, 79-73 and 78-74 while this writer had it 79-73. Lightweight Wesley Ferrer, 12-1-1(7), of Brooklyn, NY, lost a majority decision in a sloppy fight to Philadelphia’s Steven “The Hit Man” Ortiz, 9-0 (3), over 8 rounds. In the first round the taller Ortiz uses his jab well. Ferrer landed an overhand right to the chin of Ortiz rocking him. Both landed punches after the bell. In the second round Ferrer landed a right to the chin of Ortiz who had his hands low. Ortiz threw half a dozen unanswered punches as Ferrer slipped a few of them. Ferrer landed a right to the head. In the third round Ferrer landed a right to the chin of Ortiz. Seconds later Ferrer landed a left hook to the chin of Ortiz. Both exchanged left hooks to the chin. In the fourth round both exchanged a flurry of punches with Ferrer landing the final and left to the head of Ortiz. Ortiz was warned for holding by referee Lawrence Cole. Ferrer forces the action. Referee Cole warned Ortiz to keep the punches up. In the fifth round Ferrer warned for hitting the back of the head but landed another one behind the head without a warning. Referee warns Ferrer for holding. Ferrer landed a combo with the right rocking Ortiz. In the sixth round Ferrer warned for hitting behind the head. Both boxers warned for holding. Ferrer landed a good right to the chin of Ortiz. The fight continues to be very sloppy with too much holding. In the seventh round Ferrer landed an overhand right that glanced off the top of the head of Ortiz. Ortiz landed a short right to the head but was countered with a left to the head. In the eighth round Ferrer missed with a left hook and got countered with a right from Ortiz on the chin. Ortiz landed a lead right to the chin of Ferrer. Ferrer landed a 3-punch combination. The bout ended to a lack luster fight. Scores were 76-76, 78-74 and 77-75 for Ortiz while this writer had it 78-74 Ferrer. Super Featherweight James “Real Crunch Time” Wilkins, 5-1 (5), of Staten Island, NY, suffered his first loss in a lopsided loss to Misael Lopez, 9-0 (4), of Denver, CO, over 8 rounds for the Americas Super Featherweight Title. In the first round Lopez landed a flurry of punches to the head while Wilkins covered up. Wilkins warned twice by the referee for hitting behind the head. Lopez landed a 3-punch combination driving Wilkins into the ropes. Lopez moves around the ring well with Wilkins trying to nail him with little success. In the second round Wilkins missing wildly as the shorter Lopez countered with a flurry of punches. Lopez landed three left hooks to the body of Wilkins. Wilkins dropped Lopez with a low left hook. The referee gave Wilkins a warning for a second time and gave Lopez a five minute rest. Lopez after the rest starts landing right hands to the body of Wilkins. Wilkins land a counter left to the chin aft getting hit by a Lopez right to the chin. In the third round Wilkins was warned again for a low blow by referee Mike English. The taller Wilkins had trouble landing anything but a jab as Lopez counters well to the body and head. Lopez lands a flurry of punches to end the round. In the fourth round Wilkins was warned again and the referee who warned him “next time I will take away a point” didn’t. The taller Wilkins is frustrated. Lopez is beating him to the punch and willing to stand in front of him. In the fifth round Lopez works the body with left hooks. Both exchanged body punches. Finally the referee takes away a point for another Wilkins low blow left hook. Lopez started moving more and countering well. Wilkins is frustrated due to lack of landing punches and getting hit. In the sixth round another low blow by Wilkins and the referee gives him a weak warning. Lopez backs into the ropes and opens up hurting Wilkins. Wilkins was driven into the ropes. Lopez landed a hard right to the body of Wilkins. Wilkins landed a right and left combo to the head of Lopez who had his hands down. Lopez landed a good right uppercut to the mid-section of Wilkins. In the seventh round Lopez is hitting Wilkins with everything he throws. Lopez is too fast a foot and hand. Lopez landed half a dozen unanswered punches but is getting cocky dropping his hands. Lopez landed a 3-punch combination to the head of Wilkins. Wilkins came back with a long right to the chin. Referee warned Wilkins for hitting behind the head. Wilkins landed a right making Lopez whose right hit the canvas just prior to the bell but the referee failed to call it a knockdown. In the eighth and final round Lopez works the body and got hit by a Wilkins counter right to the head. Lopez raises his hands halfway through the round as if the fight is already won by him. Lopez showboats the last half a minute. Scores were surprisingly close at 79-72, 77-74, 76-75 while this writer had it 80-71. Spain’s Jon “Jonfer” Fernandez, 16-0 (14), won the WBC Silver title a year ago and this Friday makes his first defense against O’Shaquie “Ice Water” Foster, 13-2 (8), of Houston, TEX, on Showtime. Since Fernandez has not defended in a year and is ranked No. 9 in the WBC while Foster is not ranked. The fight will take place at the Firelake Arena in Shawnee, OK.
Fernandez has scored stoppages in 3 rounds in his last two fights scheduled for 8 rounds since winning the title a year ago. He has stopped Nicaragua’s Henry Maldonado, 20-6, in June and Panama’s Juan “Lil General” Huertas, 14-1-1 in April. 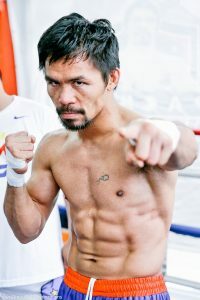 He previously has wins over Juan “Pachito” Reyes, 14-3-3, Ismael Garcia, 7-0, Ernesto Garcia III, 7-1 and Mikael “Misha” Mkrtchyan, 16-1, all by stoppages. 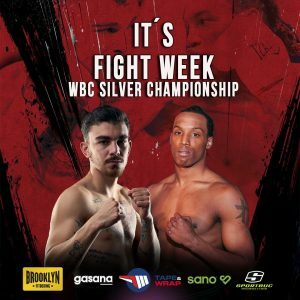 In the co-feature is Super Featherweight Irvin Gonzalez, 10-0 (9), of Worcester, MASS, is taking on Ecuador’s Carlos Ramos, 9-0 (6), of Spain in a scheduled 8. The only time Gonzalez has gone the distance is in his lone 8 rounder. Ramos is a southpaw and will be making his US debut. Lightweight Wesley Ferrer, 12-0-1 (7), of Brooklyn, NY, coming off a draw last December is taking on Philadelphia’s Steven Ortiz, 8-0 (3), who last fought in January of this year. The draw was Ferrer’s first 8 rounder. He had a very good amateur background. For Ortiz who defeated Joshua Davis, 11-2, in 2 rounds in his first 8 rounder this is a bout between two top prospects scheduled for 8 rounds. Super Featherweight James “Crunch Time” Wilkins, 5-0 (5), of Staten Island, NY, taking on Misael Lopez, 8-0 (4), of Denver, CO, scheduled for 8 rounds for the vacant American Boxing Federation Continental Americas Super Featherweight Title. Wilkins is jumping from all 4’s to an 8 winning twice in June. Lopez has a pair of 8’s on his record and last fought in February scoring a decision win.